Hypothesis: A recombinase Polymerase Amplification (RPA) can be engineered for on-field detection of Tomato spotted wilt virus with great sensitivity and specificity. Additionally the use of the 3D nanotube-based filter CNT-STEM will allow an increased detection and reliability for the detection technique. By providing our field-friendly virus-capture device and combining it with RPA that doesn’t need bulky and non-portable laboratory equipment, we expect to provide farmers and field pathologists with a system that allows early on-field virus detection, has a great sensitivity and does not require professional training or shipment to a laboratory. Plant viruses are a threat to food security, because of the huge amount of losses (sometimes as high as 100% for Tomato spotted wilt virus (TSWV) case) they cause on staple crops (Nicaise, 2014). As intracellular parasites, no prophylactic measures are available for treating plants other that controlling their vector for transmission to new hosts (Nicaise, 2014). SARE reports for projects LS07-199 (Southern SARE), SW12-040 (Western SARE) and OW14-026 (Western SARE) show that there has been interest in finding solutions for plant viruses related to the tomato production and all fall into the specifications and requirements of sustainable agriculture, as Research and education and professional + producer components. Spotted wilt of tomatoes is a devastating plant disease that causes big losses for the tomato industry. This disease is caused by TSWV, a plant virus with a very wide host range of hosts and transmitted (or vectored) by at least nine different species of tiny thrips insects. Even though countermeasures are exercised to ensure the confinement of the virus and the control of its vectors, the tomato industry and smaller growers are still trying hard to minimize the losses to the virus. This important virus can be used as test-case for other viruses infecting tomatoes. Surveys conducted in four Pennsylvania farmers in April of 2018 showed that viral diseases, especially TSWV are a concern in the state (they responded to be from moderately to very concerned), they do apply management strategies for managing thrips (3 out of 4 do not apply pesticides), and 3 out of 4 work with specialists and extension agents to make important decisions for their crops. All of them agreed that they would be interested to try this technology and interestingly, they would prefer a technology for detecting the viruses themselves on the field. Laboratory techniques can be expensive and labor intensive, and in the end can fall short on detecting low number of viruses. The proposed system is portable, affordable and can give a result in as short as 30 minutes. If further validation is needed, the products of RPA can undergo the same downstream applications as any amplification reaction. The increase in accuracy and timeliness of our proposed device and procedure should allow a grower or extension agent to decide confidently that a pesticide to control vectors is or not needed. Reducing pesticides will have significant economic, environmental and human health benefits. Earlier pathogen detection will allow earlier management decisions, which should reduce pesticide applications. Additionally, since the diagnosis is made in the field, the costs of sending samples to a lab could be reduced, and limited to those samples that need further review or specific characterization. The direct link of this project towards sustainable agriculture is to enhance the quality of life for farmers and society as a whole (USDA data) and ensure food security. By allowing an on-site detection, farmers and extension agents can test for virus-infected plants before they become foci of infection, additionally weeds can be tested for making sure they are not reservoirs of disease and better-integrated-pest-management (IPM) strategies can be performed. To complete this Objective, we modified the protocols of commercially available kits that are used for DNA amplification via RPA to amplify RNA instead, since TSWV, as most plant viruses, possesses a genome composed of RNA. For this purpose, we used the AmplifyRP Acceler8 kit (Agdia, Inc., Elkhart, IN) and added the iScript™ Reverse Transcription Supermix (Bio-Rad, Hercules, CA) for converting the RNA of TSWV into complementary DNA (cDNA). We also designed original and novel primers and a probe (both being small sequences of DNA, artificially synthesized that bind to the virus target genomic region to ensure unambiguous detection of the target virus) specific for amplification of a portion of the TSWV genome. The goal of the RPA is to make a huge number of copies of the virus genomic region contained between the primers in a small 1.5 ml test tube. This amplification renders the presence of the viral genome visible via a portable amplification detection chamber, sold separately (Agdia, Inc., Elkhart, IN). The portable chambers are plastic snap-on chambers that smash the reaction tube alongside a reaction mix and force it through a lateral immunostrip that detects the presence of the amplicon. 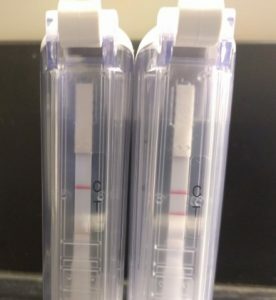 The immunostrip gives a positive result if the control band and the test band are visible, negative if only the control band is visible, and invalid if there are no bands. However, this ‘amplification’ and ‘visualization’ will only happen if the sequence designed as the target is present, therefore it can be used as a useful detection tool. From which: 56 FAM is fluorescein, idDsP is a modified base that triggers recombination, 3SpC3 is a spacer at the 3′ end of the oligo and 5BiosG is a residue that contains biotin. Two species of amplicons are generated, one that is flanked by the primers Forward and Reverse and one between the Probe and the Reverse primer, being doubly marked with FAM at its 5′ end and biotin at its 3′ end. For performing the reaction, according to the manufacturer’s procedure: 5 μl of rehydration buffer; 0.5 μl of each primer and 0.25 μl of the probe, all in concentrations of 10 μM; 0.50 μl of 280 mM magnesium acetate (MgOAc) and 0.25 μl iScript™ Reverse Transcription Supermix (Bio-Rad, Hercules, CA) were mixed with a 2 μl of crude plant sap and with a reaction pellet (provided in the kit). Water was added up to a total volume of a reaction of 10 μl, and the mix was transferred to a 0.2 mL microfuge tube. Upon closing the vessel, the reaction was maintained at 39 C (or body temperature) for 20 min, and the results interpreted afterward. For non-target controls, water was used instead of the plant extract. For cheaper in field visualization methods, we also modified and optimized the method originally published by Koo, Wee, Mainwaring, and Trau (2016) that consists of adding 1.8 μl of magnetic beads to the 10 μl reaction according to their manufacturer’s protocol. These beads bind exclusively to newly synthesized DNA and thus can be added to any product of DNA amplification. After recalling the beads with a strong magnetic rack, the supernatant is discarded and replaced by a flocculation agent like Magnesium acetate (MgOAc); in those reactions that are positive (amplicon present), floccules of beads, DNA and the flocculent agent sinks to the bottom of the vessel, making the entire mix clear. In those samples that do not have an amplicon the recalled beads redissolve in the liquid, causing it to be brown. During this funding period, we were successful in completing Objective 1. In fact, we optimized two different RPA protocols and were able to visually determine the presence of TSWV directly from the tissue of TSWV infected plants and to discriminate between infected and uninfected tomatoes. The results of our tests are explained below in more details. Detection of the amplicon using official Agdia lateral flow chambers. Left: Negative result, only the control line is visible. Right: Positive result: Both the control and test lines are visible. 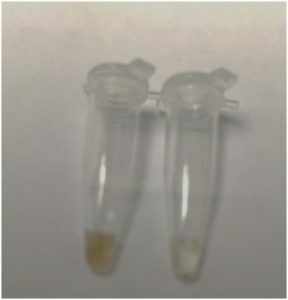 As shown in the picture, only the reaction mix that contained the sap from the infected plant (right chamber) developed two bands in the lateral flow chamber, indicating a positive test. The test line is made by antibodies that detect the doubly marked (5′ FAM and 3′ biotin) amplicon and the control line contains antibodies that react to the reaction mix. Detection of the amplicon using SPRI beads. Left: Negative result in which the are spread throughout the mix. Right: Positive result. the amplicon makes a stable precipitate with the beads, resulting in a clear solution. In the case of the beads, the results were consistent with those from the lateral flow chambers, in fact, the same plant sap that produced a double band (positive result) had a precipitate (positive result). The precipitate is stable and does not dissolve back into the reaction, confirming the presence of the amplicon by two methods. In conclusion, we were able to complete Objective 1 of the proposed work, and to provide a reliable, portable and easy to use method to test the presence of TSWV directly in the field, by using only two microliters of plant juice. This method can be used directly by growers, since it does not require any training, and can be used under field conditions. Our ability to couple the RPA method with the SPRI beads, used until now only for animal testing, allows to lower significantly the costs of this test, compared to the use of the later-flow chambers. The next step will be to improve our tests by coupling it with the CNT-STEM as proposed in Objective 2.